Drew Brees has accomplished yet another remarkable feat. 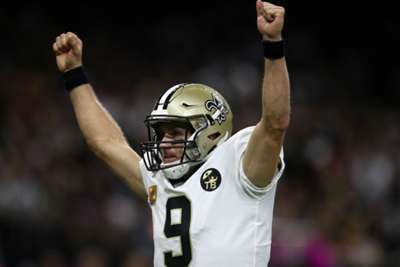 The New Orleans Saints quarterback became just the fourth player in NFL history to throw 500 career touchdown passes with a one-yard completion to Benjamin Watson in the second quarter against the Baltimore Ravens on Sunday. Brees, 39, joins Peyton Manning (539), Brett Favre (508) and Tom Brady (501) as the only quarterbacks to reach the milestone. Brees has boasted a productive season so far, setting three notable records through the first seven weeks of action. His 500th career touchdown pass! He became the NFL's all-time passing leader in week five, surpassing Manning's previous record of 71,940 yards with a 62-yard touchdown pass to Tre'Quan Smith against the Washington Redskins. He also set an NFL record for most career completions in week three, exceeding Favre's mark of 6,300 as he connected with wide receiver Michael Thomas on a 17-yard pass against the Atlanta Falcons.